There are over 300 shipwrecks on Lake Champlain. They vary from ships that had fought during the Revolutionary War, to modern airplanes and powerboats. 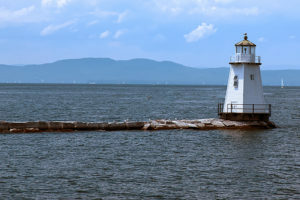 With the completion of the Champlain Canal which connected the Hudson River and Lake Champlain, Burlington became the third largest port for lumber shipping and quarried stone coming largely from Vermont and Canada. The Burlington waterfront was built because of the increasing commercial traffic on Lake Chaplain. With this increasing shipping trade came the need for a breakwater to protect mariners from the constant weather changes and storms. Canal boats brought in most of the stones that were used to build the breakwater. These boats helped to make the connection with the Hudson River leading into New York City, which helped Burlington develop as a world trade port. A 1,000-foot breakwater was completed in 1854, and gradually was extended as the waterfront continued to grow. By the late 1800’s, the breakwater had grown to nearly 4200 feet long. 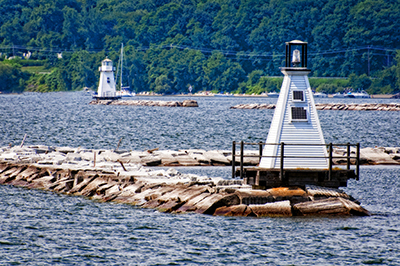 Wooden lighthouses were first placed on both ends of the breakwater in 1857, known as the Burlington Breakwater lights. Over the years, the wooden structures could not survive the constant elements of strong winds, ice, and even fires. 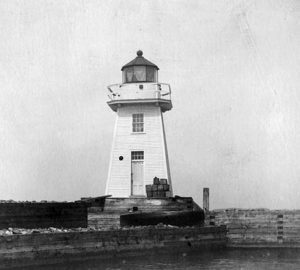 In 1870, the northern lighthouse burned to the ground, and in 1876 a fierce storm knocked over Burlington’s southern light. In 1875, a keeper’s dwelling was built on the breakwater, but being only a mile from the waterfront, the keepers simply preferred to live in the city with their families, and would remain ashore. When needed, they would row out to each of the small lighthouses to tend them. It sometimes became a challenge for them to row out to the lights on those days when rough weather, which occurred quite frequently, covered the area. The keeper’s house remained unoccupied for nearly ten years, before it was auctioned off and moved ashore. One of the greatest rescue stories in the region involves the wreck of the General Butler. In this time period, the government frowned upon and sometimes would remove those keepers who would attempt to make additional income from other occupations. James Wakefield was not only the lighthouse keeper of the Burlington Breakwater lights who lived on the shore with his family but also had a very successful business in repairing ships that was apparently allowed by the government. Before James Wakefield became Burlington’s lighthouse keeper, he had spent many years as a sailor and as a second mate to captains on voyages involving transporting cargo all around the world. He was a large strong man born in 1829, and was no stranger to incidents of rescuing crew members, aiding in saving distressed vessels during severe storms and hurricanes, and in handling drunk and unruly captains. After deciding to retire from the harsh conditions as an officer and a sailor, Wakefield spent some time in New York near his brother. In 1857, he decided to stay in Burlington, Vermont, where he developed a prosperous business in making and repairing sails, and in dealing in ship supplies as a ship chandler. His business grew as well as his popularity for being honest and fair, and for his maritime knowledge. The vessel, the General Butler, was named after General Benjamin Butler, a hero of the Civil War. She was an 88-foot long canal or cargo boat built n 1862 and was designed to sail and travel through the Lake Chaplain Canal system. Captain William Montgomery was the third owner of the vessel and lived on the Isle La Motte, located in northern Vermont. On December 9, 1876, the General Butler was heading out from Fisk Quarry on the Isle La Motte with 30 tons of marble and stone to Burlington’s manufacturing shed. On board was a crewman, a quarryman with an eye injury going for medical treatment, and two teenage girls, one being the captain’s teenage daughter and the other her friend. 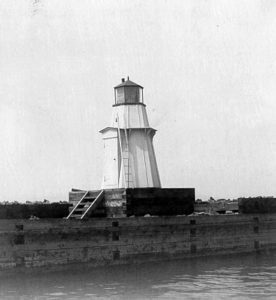 Vintage Image Burlington Breakwater North Light. Courtesy US Coast Guard. On that December day, as the General Butler sailed towards Burlington, a powerful winter gale storm was approaching and came full force upon them as they came towards Burlington Harbor. The rigging started to tatter. All of a sudden the steering mechanism broke on the vessel, causing it to be tossed around the thrashing waters near the Burlington breakwater. Captain Montgomery dropped anchor so he could try to jury-rig the tiller bar to the steering post to gain enough momentum to steer the vessel into the harbor, but the waves were too much and the anchor started dragging across the sandy bottom. The attempt to fix the steering failed and he was forced to cut the anchor line causing the ship to drift helplessly towards the southern end of the breakwater. The huge waves caused by the gale force winds were too much for the vessel and forced the ship on top of the jagged stone breakwater. Captain Montgomery knew at once the ship was about to sink with its heavy stone cargo in the icy waters, and convinced all those aboard that they had to jump the ship onto the ice-covered rocks until help arrived. One by one he helped them off the ship onto the breakwater and was the last one himself to jump off. A few seconds later the General Butler, with her heavy load of stone, slipped off the breakwater and sank 40 feet into the icy bottom. Vintage Image Burlington Breakwater South Light. Courtesy US Coast Guard. The five survivors were now in another perilous position as they were being drenched as the waves washed over the breakwater and freezing from exposure. The survivors were still about a mile out in the breakwater, which was not connected to the shore, and swimming to safety would have been impossible in the icy waters. A large crowd had gathered by the waterfront and watched the incident unfold. There were many able bodied men and old sea captains, but no one wanted to venture out and risk their own lives in the gale force winds and raging waves. James Wakefield, now in his late 40’s in age, ran towards the waterfront with his son to investigate. Upon seeing the figures of the survivors on the stone structure, he knew they were going to freeze to death if help did not come quickly. He ran back to the lighthouse and secured the small 14-foot government lighthouse boat. He and his son launched the boat amid the onlookers and started the daunting task of trying to row the craft to reach the breakwater a mile away against the ferocity of the winds and pounding waves. Both Wakefield and his son finally reached the breakwater exhausted but determined to save all from their perilous fate. The captain of the vessel grabbed his daughter Cora and her teenage friend and placed them first into the strong arms of the old sailor. Then one by one each of the three remaining crew jumped into Wakefield’s boat. The captain, again coming last making sure all were accounted for in the tiny boat. With all their strength, Wakefield and his son pulled the boat through the violent waters and winds and safely managed to bring all ashore to a welcoming crowd. Captain Montgomery’s daughter, Cora, and the others received medical treatment once they were given dry clothes and were able to regain their senses. When she recovered from the ordeal, Cora asked to make the return trip to Burlington and be present when the vessel would be raised, but the request never came about as the General Butler lay beneath the waves for eternity. That night, when the vessel finally came to rest on the sandy bottom of the lake, she lay about 75 yards west of the southern end of the breakwater. What is also interesting about this rescue is that although James Wakefield, as the local lighthouse keeper successfully rescued the crew, the Burlington Breakwater South Lighthouse near where the wreck occurred, was inoperable from a previous storm and was awaiting repairs. So, there was no illumination from the south end of the breakwater to help the keeper in his efforts. He was able to rely on his knowledge of the area to maneuver the boat to the survivors. All the survivors recovered and James Wakefield and his son became the local heroes of Burlington. The vessel was a total loss, and had been uninsured from the year before the incident, so there were no funds left to raise her. The General Butler can easily be viewed by divers and on shipwreck excursions put on by the Lake Chaplain Museum. The wreck of the General Butler became the first shipwreck in the Vermont Underwater Historic Preserve program. The hull of the vessel is still intact, and none of the interior has collapsed. The cargo hatches that were carrying the marble are easily viewable. Burlington is Vermont’s largest city offering its many events, specialty shops, restaurants, artist’s galleries, and museums, especially along the streets of The Church Street Marketplace. There are also plenty of trails for bikers and hikers inside the city and along Burlington’s Waterfront Park. 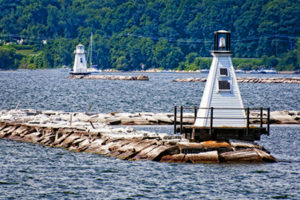 Burlington’s Waterfront Bike Path is an 8-mile route that runs along the shoreline of Lake Champlain. 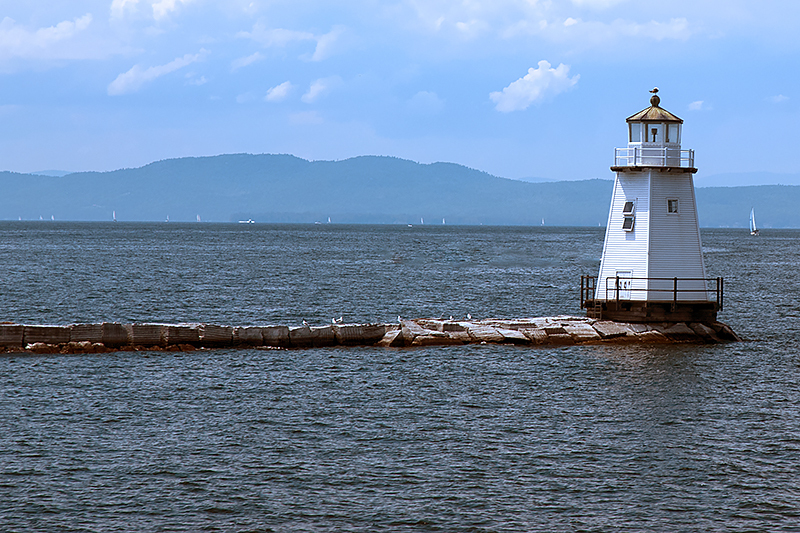 The Spirit Of Ethan Allen III is Burlington’s passenger ship that goes out past the Burlington Breakwater lighthouses on their Scenic Narrated Cruises. 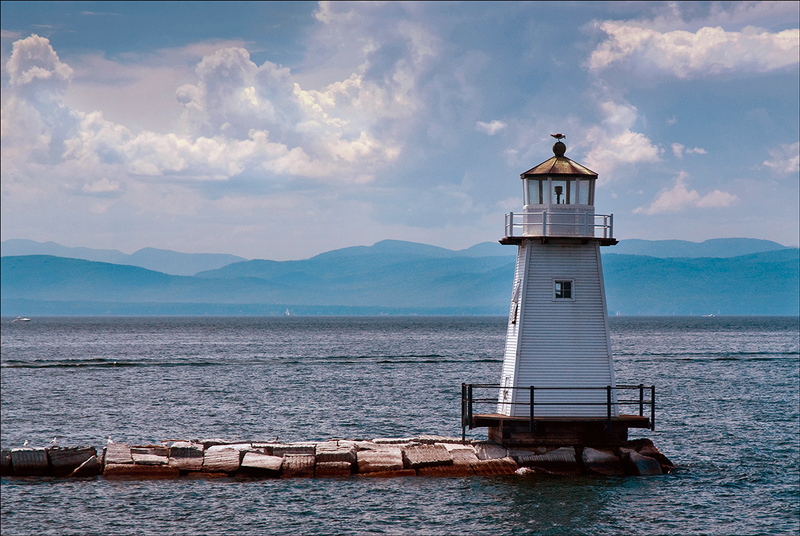 Cruises are offered daily during the summer season, taking you around Burlington’s Lake Champlain islands. My 300-page book, Lighthouses and Coastal Attractions of Southern New England: Connecticut, Rhode Island, and Massachusetts, provides special human interest stories from each of the 92 lighthouses, along with plenty of indoor and outdoor coastal attractions you can explore. These include whale watching excursions, lighthouse tours, windjammer sailing tours and adventures, special parks and museums, haunted lighthouse stories, and lighthouses you can stay overnight. You’ll also find plenty of stories of shipwrecks and rescues. Lighthouses and their nearby attractions are divided into regions for all you weekend explorers.